Sergei Voronov of Russia performs his short program at 2014 Finlandia Trophy. Russia’s Sergei Voronov, who turned 27 on October 3, is one of the older figure skaters on the circuit, but he did not consider retirement following the Olympic season. The two-time Russian gold medalist got his second wind when he changed coaches in the spring of 2013 and joined Eteri Tutberidze’s group in Moscow. He had trained for several years in St. Petersburg under Alexei Urmanov before switching to Nikolai Morozov in 2010. The skater was actually turned away by some coaches during his search in 2013, until he met Tutberidze. While he felt a bit out of place, he noted how the change pushed him to train harder. The ‘slave labor’, as Voronov once jokingly called his training, paid off. He won silver at the European Championships in Budapest in January 2014—his first medal at the event after competing in it five times since 2008. Although Voronov was the highest ranked Russian man at Europeans, he was neither selected for the Olympic Games (Plushenko went and withdrew before the short program in the individual event) nor for Worlds (Russian Champion Maxim Kovtun was sent). Voronov got busy right away at the beginning of this season. He first won a national Russian competition in Samara before finishing fourth at Nebelhorn Trophy at the end of September in Oberstdorf, Germany. During the second week of October, the Muscovite traveled to Espoo, Finland, where he captured the title in his fifth appearance at the event. For this season, the three-time Grand Prix medalist worked for the first time with Alexander Zhulin as a choreographer, and is skating to “Danse Macabre” by Camille Saint-Saëns for the short program. While the “Danse Macabre” is close to Voronov’s more classical style, the long program to “It’s a Man’s World”, “Come Together”, “At Last”, and “Big Time Boppin” is a new style he has never done before. However, he did have to make an adjustment and changed the first part of the music following Nebelhorn Trophy, using “It’s a Man’s World” instead of “Memories of Caruso”. Despite competing at the international level for ten years, the figure skater does not feel burned out. However, he is not sure if competing gets easier with experience. Since joining Tutberidze’s group, each hour of Voronov’s days is planned with little, if any, spare time. The skater gets up at seven in the morning and drives two hours to the rink where he spends his day practicing on and off the ice. 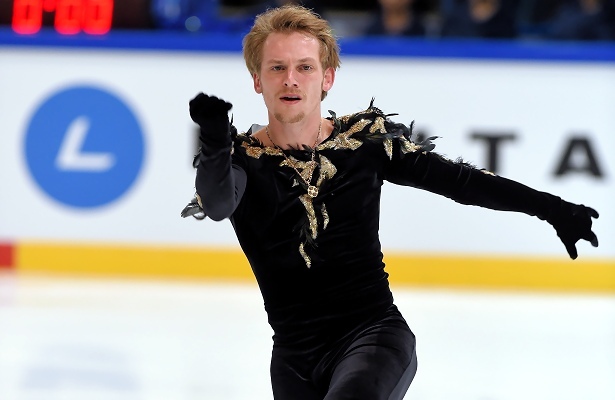 Voronov, who is currently is scheduled to compete at Cup of Russia and NHK Trophy, considers his first competitions of the season as important preparations.